If you are interested in beginning knitting, we schedule private lessons during the week as well as Saturday mornings before the shop opens. The cost is $30 for one hour of instruction; we encourage groups and offer hourly group rates as well. In one hour of beginning knitting, one can learn how to cast on, knit and purl! If you would like to be on our mailing list, please click this following link, fill out your information and you will be added! http://eepurl.com/ib3ag We still offer group classes and tell all about them in the almost weekly email! Give us a call to register for a class! Friday February 1, 9-11 a.m., $20.00. This pattern starts with a provisional cast on; the "dots" are made by learning the eyelet stitch pattern. 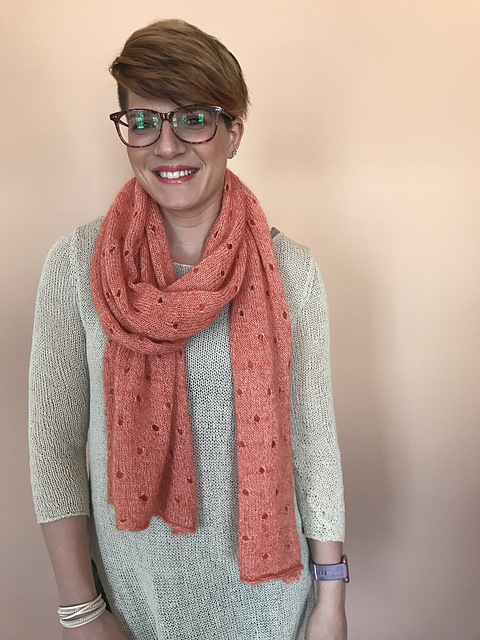 This fun scarf came be knit in two different widths, and looks great in non-mohair laceweight yarns such as Shibui Cima, or Lunar. Our favorite beginner knitter project! We recommend this two, one hour class for 100% beginners, or for people who haven't knit in many years. 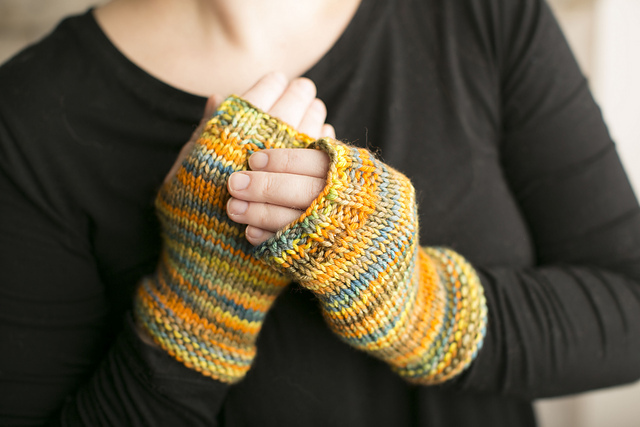 Our expert staff will get your new hobby started by knitting a pair of finger-less mittens. In the beginner classes we cover casting on, knitting, purling, binding off, and seaming. If for whatever reason you get stuck on one of these new techniques, we will modify the lesson to better suit you. We love this beginner project because it covers all three basic knitted fabrics: garter, stockinette, and ribbing. Each one hour private lessons is $30. If a friend will be joining you, it is $30 per person, per hour. 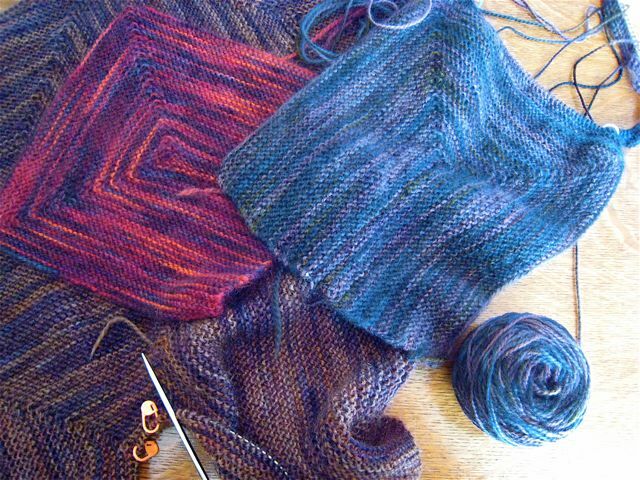 Not included in the lesson cost is the pattern, circular needle, and a skein of Rhichard Devrieze hand dyed yarn. It is not required that you purchase the materials from us, but our supplies are not like anything you will find at a craft store. Our supplies make it easier to learn to knit, and cost around an additional $35. This class can be scheduled during our regular business hours, and select Saturdays at 10 A.M.
Join Tami at the back table on Thursday February 14th to work on this sweater! This KAL will meet on the 2nd Thursday February-June from 11:30-1:00. Tami and Natalie have wanted to knit this sweater for a long time, and Tami decided 2019 is the year to do it! We do have kits in stock here , or stop in and we will help you pick out the perfect combination. This is not a class, just a chance to knit with like minded knitters who are Fair Isle obsessed. Our classes are held outside of regular shop hours so please be on time, since we lock the doors as soon as the class begins. Please be conscientious when parking for a class. Our lot can accommodate 12 cars if everyone parks in an organized manner. However, you may also park at Apex across the alley for Saturday classes ONLY. The fine print: We reserve the right to cancel a class if we do not have at least three students one week in advance. You must pay to reserve your spot in the class and we appreciate it if you purchase your supplies from us. We will only refund your class fee if we cancel the class. Do you need extra help after a class is over? Do you need extra help from a project you have purchased from us? If you need more than a few minutes, we ask that you schedule a private lesson. No materials are included in the classes unless specified. You may call and sign up over the phone, but be sure to stop in before the class to pick up supplies! Remember: No refunds on classes. Classes must be paid in full to reserve a spot. We reserve the right to cancel a class if less than three (3) people have enrolled. If you cannot attend a class and will require more than ten (10) minutes to make-up what you missed, please schedule a private lesson at our regular rate of $15.00 per half hour. Tami teaching a Fair-Isle class! The majority of the multi-session classes have two or more weeks between classes to allow time for "homework" in your busy lives. Come in or call to sign up: 260-422-YARN; 1-888-422-YARN. To hold your place in class, the non-refundable class fee must be paid at the time you sign up, and we ask that you sign up at least a week in advance. If you have a question between classes, feel free to stop by; or if you'd rather schedule a private or small group lessons, please let us know. 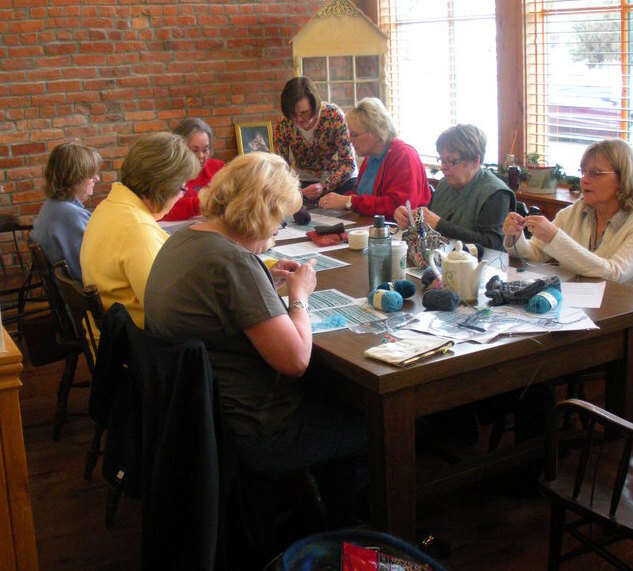 You may also want to consider knitting parties for yourselves or for your children. The beauty of Mountain Colors "Mountain Goat"